Disclosure: This is a sponsored review, however all thoughts, opinions and expressions below are my own. How many inspiring teachers have you had in your life time? Like myself you probably can count them on one hand. Personally, I believe you have to have a true passion for something or at least a pre-planned mission to be successful at anything you do and this is very true for teachers. I grew up in one of the largest public school systems in America so I know first hand how important the job and impact of teachers is. The educational lessons taught by a good teacher may or may not seem as important or useful to you once you're an adult living in the "real world" (besides the basic skills: math, reading, writing) but a great teacher's impact on life is forever whether you realize it or not. Today I can only remember about three teachers when I was in school that left their mark on me and truly inspired me to do better and be better everyday (and still do), which is kind of sad when I think about it because inspiration for success should come from every teacher. In his third documentary film "TEACH" about education in America; Award-winner Davis Guggenheim asks the question: What Does It Take to Be A Great Teacher Today? The TEACH documentary follows four very dedicated teachers from different schools across the country over the course of one school year giving viewers a look into the challenges, demands and rewards of teaching, with the hopes of bringing attention to and promoting the profession, engage new teachers and supporting current teachers. As intense as it is emotional, this year in the life of four public-school teachers illustrates how tenacity, passion and a belief in innovation drive these educators as they navigate the daily ups and downs of the 2012-2013 school year. These educators use conventional and unconventional methods and do whatever it takes to overcome obstacles and strive for success. Debuting as a two hour television special the TEACH documentary presented by Participant Media is schedule to air on the CBS Television Network on September 6th at 8:00 pm ET/PT. 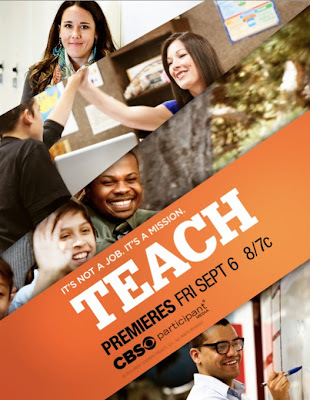 TEACH will also air on the new network, Pivot on September 18th at 8:00 pm ET/PT. Click HERE to watch the TEACH film trailer!